Concepts #3 and #4 focused on the SRRR (Farmington to Phillips) and the F&M (Strong to Bigelow) and Concept #5 does the same in a single deck form. The single deck simplifies construction and phasing. Rather than mushrooming Farmington and Bigelow, Concept #5 places the two locations back to back on opposite sides of a backdrop. An optional connection between Bigelow and Farmington as well as another connection at the Phillips covered bridge to Strong could make for a large loop to loop for continuous running (with auto reversing). Possibly a better option would be to complete the continuous run, be reconnecting the Rangeley staging to the south end of Kingfield. Bigelow would have plenty of length to add the Sawmill. Farmington’s upper yard would have to bend or be omitted. Strong has it’s natural curve to the left (going north from Farmington) and Phillips has its prototype curve to the right (going north from Strong). However, Phillips is scrunched and aisle way is tight. Kingfield, as the hub of the F&M has potential but still remains tight (Similar to Concepts #3 and #4). Might require flipping and have the main go behind the station area. Salem on the F&M has been removed and the logging between Kingfield and Bigelow becomes an emphasis of the layout. Aisle arrangement of this version is very good. As a single deck, the duck-under/gate could be 50+ inches clearance. This layout is a single deck, so the only required grade is the one down to Rangeley staging. As mentioned above, a single deck enables the whole railroad to be build at a good viewing height of say 55-57″. It also ensures clearance over a 36″ (counter top height) high work bench and sinks. One operating concern is the lack of intermediate locations. TT&TO operations are about being out on the line in dark territory, the crew makes decisions to go or not. All towns are major towns (would have station agent), so there is no “dark feel”. Phase 1: Continuous Run: Bigelow, Carrabassett, Kingfield, Strong (modified to connect Starbirds to South Strong), Baker Stream, Duckunder, continuous run connection. Phase 3: Correct Strong, build Phillips peninsula, and add Rangeley Staging. 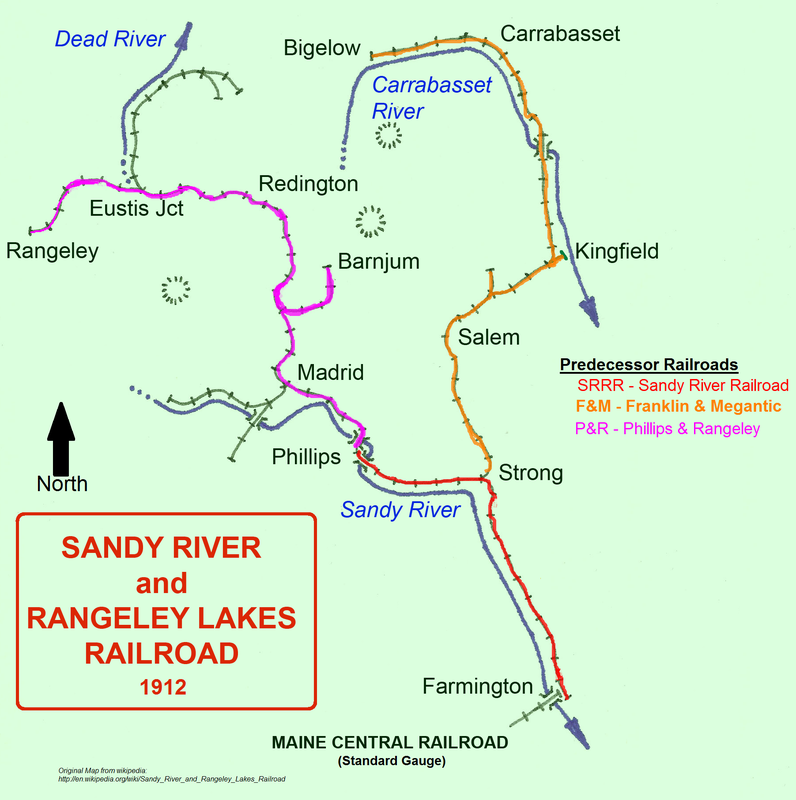 Optionally, make new continuous run connection from Rangeley to Kingfield. These phases seem very reasonable. The first phase goes all the way around the room, but is not complicated or wide. Includes my top locations to model. Any location could be made Free-mo and added to my collection of locations to take on display (upper decks are hard to make moveable). This would allow the pieces of the layout to move later on. Short runs between locations, limited “dark” areas, trains go from major town to major town.